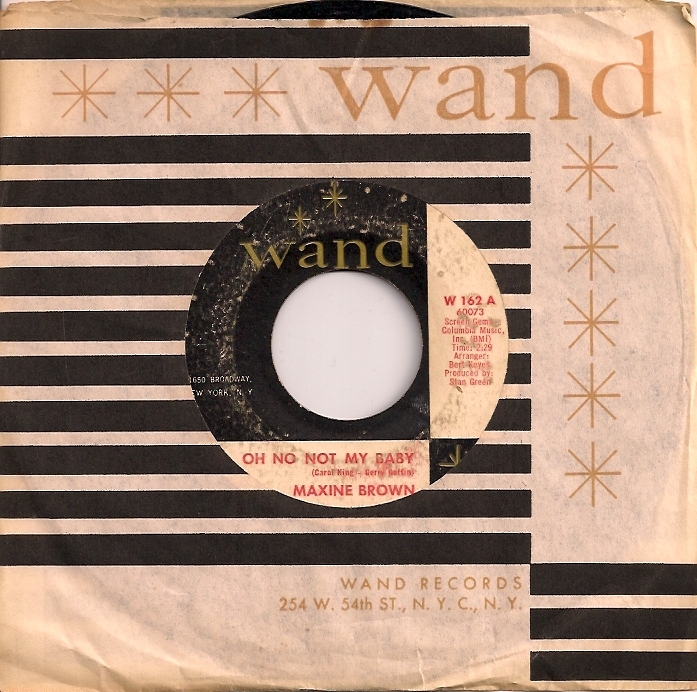 Soul Serenade: Maxine Brown, "Oh No Not My Baby"
Maxine Brown was one of the most respected soul singers of the ’60s. Then a fateful decision by her label left her in the lurch. My friend Glen Burtnik is a rock and roll hero in my former home state of New Jersey. While people around the world know him for playing in latter-day versions of Styx and the Electric Light Orchestra, in NJ he is known for a series of themed shows that he does each year. The fans fill the state’s mid-sized theaters for his shows which might recapitulate a Beatles album, or celebrate the Summer of Love because they have come to appreciate the care and expertise that Glen puts into each of these shows. I was back home in NJ for one of his Summer of Love shows a couple of weeks ago, and it was another wonderful experience. I fully appreciated the respect that Glen gives to the music of my youth. If you’re a regular reader you might have guessed by now that Glen was the inspiration for this week’s column. No, not for something he played at the Count Basie Theatre in Red Bank a couple of weeks ago (though there were several good soulful choices in his set), but for a somewhat obscure, wonderful song that he posted on Facebook last week. Maxine Brown got her start singing in gospel groups in New York City in the late ’50s. In 1960 she signed to the small Nomar label. Her first single for the label, “All In My Mind,” became a #19 hit on the R&B chart, and her follow-up, “Funny,” made it all the way to #3. Everyone expected her to become a star when she signed to ABC Paramount in 1962, but things just didn’t seem to work out for her there. None of her singles for ABC charted, and the following year she signed to the New York soul label Wand, a subsidiary of Scepter Records. For the next three years, Brown was a hit machine for Wand. She had a series of big singles for the label. The biggest of them all was the Carole King – Gerry Goffin penned “Oh No Not My Baby”, which made it to #24 on the pop chart in 1964, and spent seven weeks in the Top 40. The song had originally been recorded by another Scepter vocal group, the Shirelles, but their version was deemed unreleasable as a result of the alternating lead vocal parts they chose to employ on the recording. Brown used the Shirelles backing track for her record, but the group’s vocals were erased. Other hits followed, including “It’s Gonna Be Alright” in 1965, and “Something You Got,” a duet with label-mate Chuck Jackson that same year. Brown’s career was more than just the hits though. The backing vocalists on her records were Cissy Houston and the Sweet Inspirations, who also backed Elvis, and the young songwriting/producing team of Nick Ashford and Valerie Simpson. Ashford and Simpson hoped to write hits for Brown and Jackson, and they attempted to attract Scepter to their song catalog. The label rejected them though, and they took their songs to Motown. Songs that Ashford and Simpson had written for Brown and Jackson, including “Let’s Go Get Stoned,” (Ray Charles), and “Ain’t No Mountain High Enough” (Marvin Gaye and Tammi Terrell), ended up being enormous hits for others. Scepter’s mistake was not just a bad decision by the label, it had a profoundly negative impact on Brown’s career. Brown finally left Wand in 1969. She recorded for a couple of other labels, and had some minor hits, but by the end of the decade her career as a hit maker was effectively over. She remains one of the most respected soul and R&B vocalists of the classic soul era.